A stroller-pushing mom was tragically killed after a driver hit her as she walked with the stroller and two other small children on the side of the road. A 27-year-old woman was apparently straddling the white line as she walked southbound on U.S. Highway 19 near Spruce Street. A 33-year-old man from Port Richey said he was turning right onto Pine Street when his pickup struck the woman. The force of the collision threw her onto the grassy median and overturned a stroller containing her 2-year-old daughter. When emergency responders arrived, her stunned children were standing next to her. The woman was pronounced dead at a nearby hospital where her daughter was treated for serious injuries. The Port Richey man was not hurt. 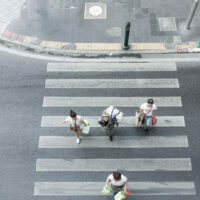 The number of pedestrian fatalities has increased substantially since 2010. Today, more people walk than ever before. Yet, many drivers still fail to maintain a proper lookout. Pedestrian accidents are especially a problem in areas like Tampa, where there is a high and rather dense population along with relatively pleasant year-round weather. Head Injuries: Pedestrians have absolutely no protection against oncoming cars. So, they are totally exposed to head trauma injuries. Moreover, the force of the collision usually throws these victim several yards, and that motion alone could cause an internal injury. Internal Injuries: The brain is not the only internal organ at risk in pedestrian-auto collisions. Other organs usually rub against each other in the crash. With no skin for protection, these abrasions always cause serious blood loss. As a result, many victims lose up to a quarter of their blood in these accidents. Nerve Damage: Victims usually land very hard after being thrown. If they are still conscious, they usually extend their arms to break their falls. That reaction often causes permanent nerve damage in the vital brachial plexus area. The medical bills usually tell the story of these physical injuries. Based on these bills and the victim’s story, an attorney can estimate the amount of noneconomic damages. The police report may be important as well. However, as pedestrian victims are usually too seriously injured to give statements, these reports often only contain one side of the story. Damages in a Florida pedestrian accident usually include compensation for both economic losses, such as lost wages, and noneconomic damages, such as emotional distress. It is not enough to collect positive evidence and develop appropriate legal arguments. An assertive attorney must also be ready for any insurance company defenses, even the most baseless like when the insurance company claims the plaintiff did something wrong in a rear-end collision. As mentioned, most of these incidents occur outside marked crosswalks. If that’s the case, the contributory negligence defense may apply. This theory essentially shifts blame for the accident from the tortfeasor (negligent driver) and onto the injured victim. In the above story, it appears that the victim may have partially been in the traffic lane. If that’s the case, the insurance company may be able to reduce the amount of compensation it must pay the family. If this doctrine applies, it excuses liability. Many insurance company lawyers argued that the victim “darted out” into traffic and so the tortfeasor could not avoid the crash. But a jaywalking pedestrian is usually not a “sudden emergency” in this context. That label is reserved for tire blowouts, hood fly-ups, and other utterly unforeseeable events. Additionally, it is difficult to believe that a stroller-pushing mother with two small children in tow could have “darted out” in front of anyone. Pedestrian accidents are common in Florida and they almost always involve catastrophic injuries. For a free consultation with an experienced personal injury attorney in Tampa, contact The Matassini Law Firm, P.A. Home and hospital visits are available.